PushPedal was born out of my enthusiasm for all things bike! As a small local business I pride myself in a personal service to a very high standard. 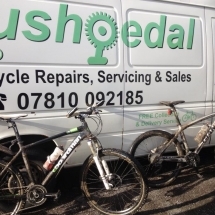 If it’s a puncture repair, a full service or a new bike you’re looking for PushPedal can help. We also recognise the hassle involved with trying to get your bike, that isn’t working to a shop so we collect, deliver or undertake the work at your home or place of work. If your bike is important to you, make sure you use a service you can trust. A badly repaired bike not only is a waste of money it can be dangerous as well. Push Pedal is trusted, why not see why? Brilliant service all round. I got my dates wrong and Darren drove over to open up especially. Made me a superb coffee whilst I waited! Fantastic customer service. 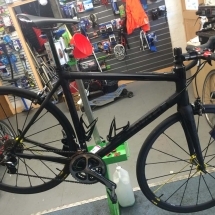 I recently had some work done on my bike by Darren at Push Pedal in preparation for the Caledonian Etape. Bottom Bracket, Head tube bearings, replacement bars, re-cable and general tidy up. I can’t stand the slightest of squeaks or rattles coming from the bike when riding and Darren made sure everything was in order, a top job, the bike is running like a dream! I’ve used Push Pedal for years now. Always great service and sorts all my bikes out really well. I can trust Darren to fix any bike problems. I would recommend him to all my bike riding friends. Fantastic service Darren collected my bike, having advised me of the work needed to be done and giving me an estimate. It was brought back within the week. Looking and riding like a new bike. Great when you do not have the means to get your bike to the repair shop. Great service I will use it again and have already recommended Darren to lots of my friends. My Daughter managed to puncture her bike tyre when riding up the curb, I only have a small car and my first thought was how I was going to get the bike to the shop to get it fixed? that’s when I remembered I’d had a flyer through my door a few weeks earlier. I called Darren and to my surprise he was able to look at the bike the same day, better still, he was able to fix the puncture there and then! Being mobile and able to come to me was such a huge help, I would recommend Push Pedal to anyone who owns a bike! Quick, very reasonably priced and friendly are the words that sum up my experience. We set off for a short bike ride straight away after you had delivered them, and while that might be only a short test, we are confident that we can provide a shining review for your website! So . .
We really appreciated how you came to us, since it was such a hassle to try to get the bikes in the car to Witney. You were prompt, friendly, reliable, and loads cheaper than at most shops. You were just off to fix a puncture, which sounds like a pretty useful service to me. You didn’t mind that we knew nothing about bike repair, the important thing was that you knew what you were doing. 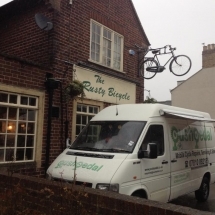 Our bikes were like new after the premier service, we were really pleased, and we will recommend to all our friends. We think Darren is really providing a valuable service, which should catch on. He sells bikes too!! Darren was courteous on the phone and quickly sought an opportunity within his schedule to fit in the servicing of my mountain bike. He carried out the service at my house, in the driveway, leaving no mess. The service was completed within a few hours,to a high standard and at a very reasonable cost. 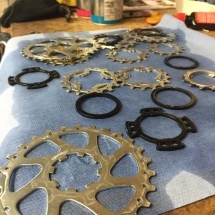 The moving parts were well lubricated and it was obvious by the subsequent ride that Darren had taken time over the adjustment of the brakes and the gears, including making good a loose cover that I had used insulating tape to secure. He offered clear and sensible advice about issues that I may face with parts that were showing signs of wear and tear. All in all a professional job that I would recommend to anyone and will make use of in the future. Took a punt on a bike off Ebay and booked Darren for a service. He came to me which saved the time and trouble of getting to and from my nearest bike shop and was generous with his advice and know-how. End result – I now have a bike in as good as new running condition at a very fair price. Incredibly, the work was undertaken the same day and I am now in possession of a gleaming “Record Sprint”, looking like its just come out of the shop. I feel like I made a great investment with “pushpedal” and I wouldn’t hesitate to recommend your personal service to anyone. From start to finish, I thought your advice and actions were first class. I had often thought about getting my old retro racer back on the road but wasn’t sure how I would be received at the local Bike store! Happily, you were able to provide me with an immediate appraisal and quote for a thorough service, most importantly giving me the impression that you thought it was a worthwhile project and you also showed a genuine interest in the Bike itself. If you’re searching for “mobile bike repair oxfordshire“, think Push Pedal.